When did Toad get a flaming tongue? So, I was on the Internet earlier, and as I was browsing through some X-Men sites, I read that apparently Toad has developed a new mutation where he can now engulf his tongue in flames. So... can somebody explain when this happened? I'm a little behind on the X-Men books, but didn't realize they were making such... unique changes. 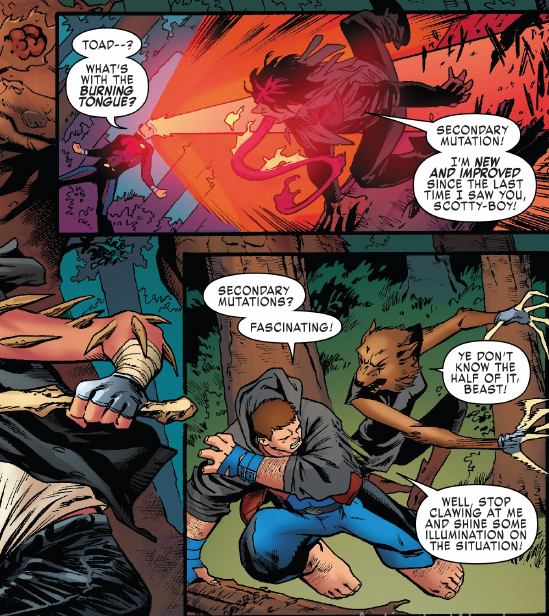 In X-Men: Blue #7, Toad's tongue is now capable of setting things on fire. No further explanation is given other than that as he matured, he developed a secondary mutation. Not the answer you're looking for? Browse other questions tagged story-identification marvel x-men or ask your own question. Could Gambit rescue Rogue from Toad without injuring her? Can Ultimate Toad spit mucus? Is the X-Men: Evolution Toad immune to his own slime? Is Jean Grey the only person Toad has slimed? Who was the first person to be slimed by Toad? Is the first X-Men film the only time Jean Grey has been slimed by Toad? When did Heimdall get dark skin? What Marvel paperback did Toad fight Eel and Wolverine in a Madripoor Tournament? What happened to Viserion in Season 7? How would it unbalance gameplay to rule that Weapon Master allows for picking a fighting style? What is the evidence that custom checks in Northern Ireland are going to result in violence? Was there ever a LEGO store in Miami International Airport?